In 2010, filmmaker Jafar Panahi was prosecuted by the Iranian government. Accused of colluding to undermine national security and producing propaganda against the Islamic Republic, he was sentenced to imprisonment and a twenty-year filmmaking ban. Since then, whilst awaiting the result of an appeal, the director has produced two feature films. The first was documentary This Is Not a Film (2011), which details life under house arrest in Tehran. 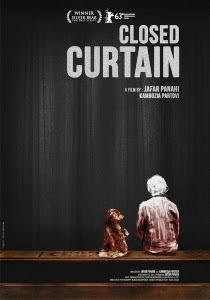 The second, Closed Curtain (2013), is a fictionalised examination of the same themes that regrettably lacks the subtlety one might expect from the venerated auteur. A still shot looks out across a coastal landscape through a large window, across which metal shutters appear strikingly like the iron bars of a jail cell. A man arrives with a bag and locks himself into the villa in which all of the action will occur. The man, known only as ‘Writer’ (co-director Kambuzia Partovi), proceeds to close all of the curtains before opening his bag to reveal a canine companion. A news report explains that dogs are unclean, and thus illegal; it would appear that the Writer is ensconced to save his (and man’s) best friend. Clearly, there are immediate parallels to be drawn between Closed Curtain Panahi’s own plight; rattling around a big house, unable to leave having broken the laws of the state. The metaphorical nature of the piece develops when a young man and woman take shelter in the house to evade capture. The man leaves but the woman, Melika (Maryam Moqadam), who is an apparent suicide risk, remains. At this point, Panahi has created a palpable sense of tension and mystery in a deeply personal film that is nicely poised to explore the effects of incarceration on emotional well-being and perhaps, creativity. If it is creativity that is under the microscope, however, the narrative perambulations of the film’s latter stages are themselves suggestive of imprisonment’s adverse consequences. When Panahi himself arrives in the frame and the two character’s true identities are slowly revealed, all sense of engagement and intrigue dissipate. Whilst the reflexive nature of its development leads the film into something approaching abstraction, its conclusion presents its deeper meaning dully, and far too overtly. Some have chastised Panahi for his post-arrest films being all too indulgent. Although the reasons for this are easily understandable, that claim is undeniably true of Closed Curtain. For a filmmaker who had striven for years to imbue his films with a social conscience, without being censored by his government, his latest offering lacks the sophistication that has brought him deserved international acclaim. The 57th BFI London Film Festival takes place from 9-20 October, 2013. For more of our LFF 2013 coverage, simply follow this link.